Law firms have a reputation problem. It is one that hides behind increasingly sophisticated branding, clever PR campaigns, detailed client listen and staff engagement programmes, and the arsenal of other marketing tools at their disposal. It isn’t a problem unique to professional firms, but one magnified by the partnership structure. And it rests with the very people that deliver legal services. Law firms are amongst some of the most successful and long-lasting businesses in modern history. The demand for quality legal services is high and grows year on year. The contributions they make to the global economy is impressive if not always recognised. It has made people at the top of the professional extremely wealthy. These achievements have traditionally been, and largely remain, the result of lawyers themselves. Today, law firms are often sophisticated, global businesses with armies of management professionals to drive new technology, attract new talent, project management and, of course, marketing and business development. Some 25 years ago when I started in a PR and communications role with the long-gone law firm Wilde Sapte, there was a real divide between fee-earning and support staff. Fee-earning staff were known internally as productive and support staff, unbelievably, as unproductive. Partners would refer to the marketing team as the ‘events and umbrellas’ team and even ‘the colouring-in department’ – perhaps in jest, but you could never tell. Much has changed since then, but much remains the same. 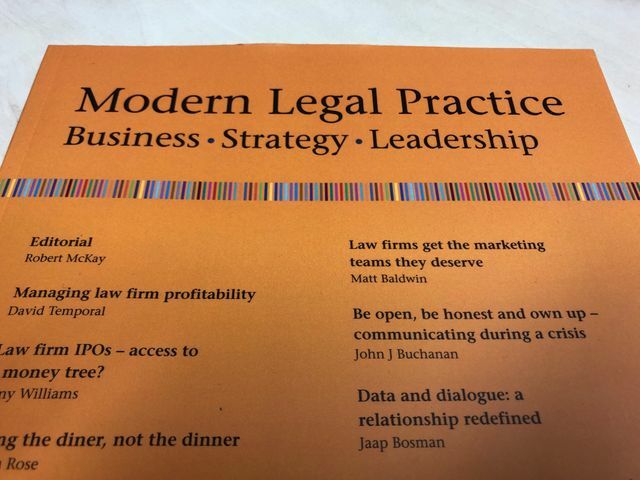 Law firms have learnt to rely heavily on their management teams – some more so than others. IT and technology will, for example, include lawyers on evaluation panels but they are in the hands of their IT teams. HR will lead the hiring and firing, and facilities management teams are usually left well alone. But when it comes to the wider marketing functions, everyone is an expert. Marketing teams were, and many still are, the doers of stuff, often at the beck and call of fee-earning staff. Some recent examples, all real, illustrate the point. A firm wishes to appoint a PR agency. The BD head and PR team will initiate the search and narrow down the field. But who makes the final decision? A room full of lawyers. Another firm changes its outdated website. Again, the marketing team will lead the project, shortlist and perhaps even appoint the digital agency. But then lawyers will spend hours bickering over a word here, a colour choice there, and spend even longer on their biographies. And even the most basic of marketing activity, events and seminars, is not immune to lawyer input. It is almost impossible to imagine a scenario where it makes financial sense for a high billing partner to take two hours out of a day to agree canapes for the client Christmas party. These are all real examples, and whilst the point being made is a broad generalisation, it is at the heart of the reputation challenge facing legal businesses. It is of course absolutely right that in partnerships partners play a role in agreeing the marketing or business development strategy a firm is going take. But should they then oversea or micro-manage its implementation? Firms hire expensive and very good marketing teams, only to ignore the advice and counsel they offer. And this problem is not just limited to marketing and BD functions. Stories abound in the legal press of the bad behaviour of fee-earners is tolerated for so long that it almost becomes a laughing stock, where staff are made redundant when ill or on maternity leave, and where women often have to fight harder for the same pay. It is perhaps a case of doing what we say, not what we do. And then there is the client profile of a firm. Very few, if any firms, consider the reputational impact to a firm of taking an instruction from businesses or private individuals with, for example, a questionable tax history or perhaps a government with a history of human rights violations. It is true that no business is immune from these issues. But the partnership structure seems to magnify these issues more clearly. Writing this at a time when more and more law firms are reportedly exploring stock exchange listings, it is only likely to become more of a challenge. It will be interesting to see how the share price of a listed law firm is affected by a star partner having to leave under the cloud of inappropriate sexual behaviour at the office Christmas party. Perhaps that will focus minds. Reputation, its value, how it should be nurtured and managed remains little understood in the legal profession. The voice of the marketing and BD department is often not heard. Who is responsible for that pitch? Who secured and penned that article in The Times? And what about that award win? Marketing teams need to make sure their voice is heard, and their contributions are recognised. Yes, we are there to help facilitate partners in their marketing, but that does not mean we should not take credit. PR and comms teams need to better explain what they do. In short, they need to up their own PR. Marketing the marketing department to your internal audiences is critical. Comms professionals need to exert their authority more forcible and more often. And that means having a better understanding of what their partners are doing and who they do it for. That might be easy in a firm acting for owner-managed businesses and domestic private clients but is a real challenge in larger firms involved in complex multi-jurisdictional work. Any PR serious about their career will want to take the time to really understand the business they are working for and the products/services it sells. Law is no different. In many firms we come across the message delivered is controlled entirely by the lawyers. The result will go one of two ways: highly technical legal articles that appeal to no-one but the lawyers themselves, or vast amounts of content created that nobody reads. Technology sometimes exacerbates the problem. Take, for example, Passle. I am a big fan and we use it ourselves. But firms are adopting the platform and rolling it out across entire firms giving little thought to what partners say and how they say it. At no point does anyone take a step back and ask what value does this piece of content add? It is time, particularly for larger firms, to appoint a ‘content editor’ to manage what is published, when and how. This sounds so obvious, yet still remains a challenge. Without the support of a management board nothing will change. Of course, the BD director is likely to have the support of the management board with the authority to deliver the full marketing programme. But that is often not enough. The need for the management board to support or sponsor individual initiatives is often required to affect meaningful change. It is said that law firms get the team they deserve. Trust your team and they will reward that trust. Micromanage that team and they will do nothing. lawyers are difficult task-masters and will often get their way simply because the marketing team did not have the spine to say no. Employ only the best and provide the support to those more junior in the team. One measure we have found to be helpful is to take the team out for one hour a month to think, talk and discuss what can be done better, what isn’t working, and new ideas for marketing activity. Bring outside experts into these sessions to inspire or challenge thinking. Leave phones and the day-to-day stuff at the door. Law firms have only been able to proactively market themselves for relatively short period of time, and it is astonishing what has been achieved. Whilst the ghost of events and umbrellas remain, marketing teams are sophisticated, clever and making a real difference. It makes me excited for the next 20 years. This article first appeared in the October 2018 edition of Legal Practice Magazine.